In the southern coastal community of Ogunquit, local conservationist Bob Joyner walks through the town common, and surveys the grass. And it couldn’t look better to him. Ogunquit is among the growing number of Maine towns that are restricting the use of lawn chemicals from municipal property because of environmental and public health concerns. About two dozen other communities have adopted some form of pesticide limits, including Brunswick, Castine and Harpswell. 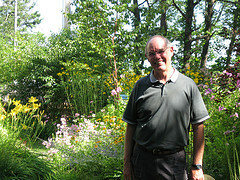 “They tend to have wealthier residents that do more lawn care,” said Gary Fish. He manages pesticide programs for the state Board of Pesticides Control, and he sees common traits among the towns that are limiting pesticides. It’s no coincidence that many of the towns who’ve taken action against pesticides are coastal. Residents are reminded everyday of where the pesticide run-off goes. 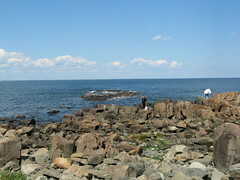 Over on the popular walking path in Ogunquit called Marginal Way, visitors and residents, alike, can watch terns dive into the ocean for fish. “They’re only here because the water hasn’t been totally destroyed and there’s still fish,” said Mike Horn. He serves as the chair of Ogunquit’s Conservation Commission and he guided the pesticide restriction to passage at last year’s town meeting. Horn is worried about lawn chemicals such as phoshorous and nitrogen trickling downhill during rain. “What is going to happen if this level of pesticides just continues to rise and people’s lawns are just running, you’re just putting a big nail in Mother’s nature’s foot,” said Horn. 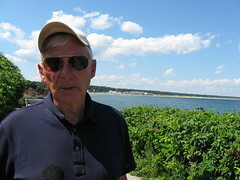 He added that by protecting the environment, the town is also protecting its economy. But a trade group for lawn care specialists say that towns can actually create problems for themselves by not using pesticides. Tom Delaney, director of government affairs for the Professional Landcare Network, or PLANET, says that pesticide-free property needs more mowing and weed pulling. Slacking off, he says, could lead to hazards. Delaney acknowledges however, that lawn chemicals can have an effect on marine life, and that the trade group discourages the overuse of pesticides. He urges property owners to consult with their local university cooperative extension and professionals for ways to reduce runoff from pesticide applications. “If it’s not made properly, if it’s made to soil, that is somewhat bare and on a slope, if some of the product gets on an impervious surface like pavement, there is certainly the possibility of pesticides and nutrients running off into water bodies,” said Delaney. Many Maine property owners appear comfortable with this risk. Mainers spread more than 6.2 million pounds of pesticides and fertilizers in 2007, the most recent year of data from the board of pesticide control. That’s up from 800,000 pounds in 1995. Pesticide opponents praise towns for cutting back on pesticide use but say that a ban on private use would make a bigger difference. “Nobody has tried to ban it on private property yet,” said Paul Tukey, a former lawn care specialist who got out of the business when he says he got sick from the pesticides. As the founder of safelawns.org, he’s watched various Canadian provinces carry out pesticide bans on public and private property. “Because of our constitution, it’s ridiculously difficult to take away homeowner’s rights– unless we ban the product outright. Then its not a homeowner property rights issue any more,” said Tukey. Tukey has been bringing his message to various towns around Maine, by showing his documentary film “A Chemical Reaction,” which chronicles Canadian’s fight with the pesticide industry. After a showing in South Portland, city councilor Rosemarie DeAngelis says she was interested in a citywide ban on pesticides, but recognizing the challenges of that, she wanted to reduce the use of pesticides on city property. “I believe there’s some use of synthetics in some parks and other open spaces. so I’d like to start by having the city in its practices be completely synthetic-free,” said DeAngelis. And from there, DeAngelis says she would like to start a grassroots campaign to get residents to voluntarily stop using pesticides on their lawns. Maine Public Broadcasting Network, Maine News & Programming.